As implied (and explained), xy.css is a lightweight CSS template for creating semantic HTML5 designs on a responsive liquid matrix. At its core, xy.css neutralizes rogue browser styles, combines horizontal and vertical grids, and provides a flexible template for responsive design. From there, xy.css facilitates clean, device-neutral designs with a complete set of preset classes for easy layouts via grid-based columns and rows. These key techniques coalesce in xy.css, providing the control, flexibility, and consistency required for responsive, grid-based design. To see some examples, check out the Demos. 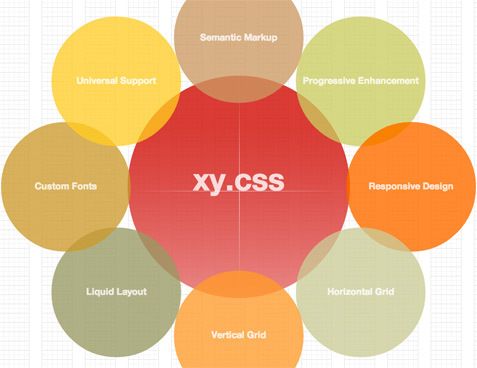 So that’s it in a nutshell: xy.css is a CSS template for responsive grid-based design. It’s all open source and very much a work in progress. The plan is to bring a few like-minded individuals on board and take it to the next level. Drop a line to learn more. To view the vertical grid, click the “show matrix” button. To see the horizontal grid, resize the browser width to 984px and click the “layout grid” button. Visit Tools to implement any of these diagnostic techniques on your own web pages. Here are some additional screenshots demonstrating the responsiveness of xy.css. 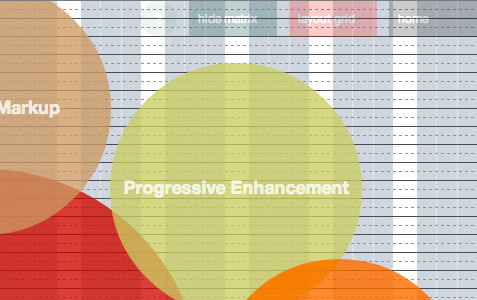 And of course all of this responsiveness is perfectly aligned with the liquid matrix (horizontal and vertical grid). Here’s one more for the road..
Visit xyCSS for responsive, grid-based action! I’ve also designed my new site with xy.css — check out WP-Mix.com for a fresh mix of code snippets and tutorials, delivered via responsive liquid grid. Learn more about WP-Mix! Jeff, this is phenomenal. Thanks so much for putting it together and sharing. We all know responsive is the way to go now, but this is ahead of the curve for sure. 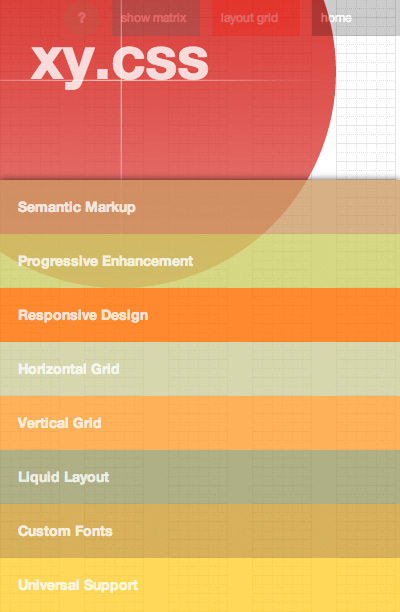 I love the collapsing circles – I think people are only scratching the surface of the potential for responsive. I can only imagine the first ecommerce site to do something like this – unless you know of any examples? I can’t think of any examples, but I’m sure by now it’s been done. Maybe someone else knows..? wa, i had knew from another site to intro your new site! Interesting… (I typed Interesting… then hit tab and it took me to your search box.) Tab order of forms, the forgotten old school website usability optimization technique. Anyway I’ll check it out in depth tomorrow and it the mean time. I’ll Tweet. What is “the forgotten old school website usability optimization technique”? And, is there a better/newer way of doing it? Impressive stuff, Jeff. You just can’t stay away from that bleeding edge, can you? 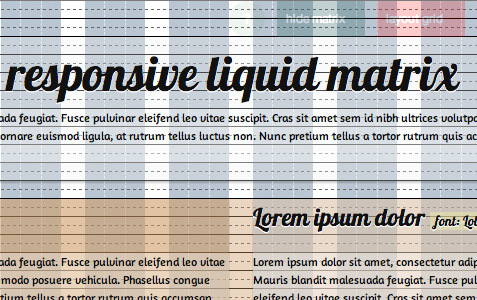 It’s definitely leagues ahead of 960grid and ooCSS, both of which I’ve meddled with in the past. I’m curious to know your thoughts on the vertical grid technique adopted in TwentyTwelve (using rem units with pixel-equivalent fallbacks). I’ve only just got my head around that and yes, it’s a chore to double-state everything but it does avoid the gotcha where em units cascade into nested lists. How are you coping with that in xyCSS? Never used rem units, never had the need to go beyond pixels, ems, and percentages. I do like the TwentyTwelve theme but haven’t really looked at it too much. I think it’s great if the design is grid-based.. will now have to check it out. Why use ems for lists? Using pixels works great for (nested) lists, so that’s how it’s done in xy.css. I think a lot of people are getting confused with too much talking and not enough doing. What are your thoughts on using the generic font-family: sans-serif; versus font-family: "Helvetica Neue", Helvetica, Arial, sans-serif;? Liquid works great. Love to hear your thoughts on keeping logos and images looking as they’re meant to look on small screens/mobile browsers.